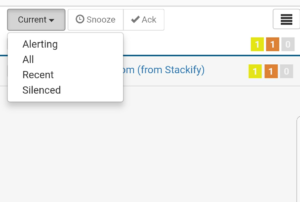 Once the filter has been selected, check the check boxes for the alerts you wish to take action on and tap either the "Snooze" or "Ack" button located at the top of the screen. 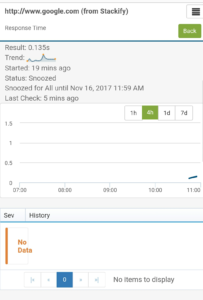 You can click on an open or recently changed alert to expand the details for that particular alert. 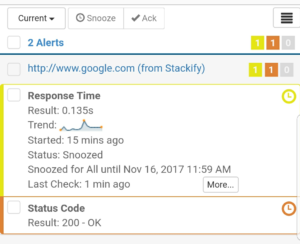 Here you will see the status, trend, and last check of an alert. Click on "More..." to view the monitor chart and alert history. You can switch to different time periods to see a more historical view of the monitor that alerted. Clicking on the right menu icon will allow you to logout or view the Retrace desktop site. You can easily switch back to the mobile view by clicking on the phone icon in the navbar.